Hello! 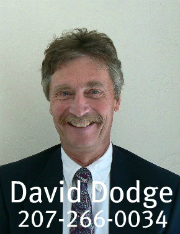 My name is David P. Dodge. I'm the Designated Broker for Margo H. Stanley Real Estate in Southwest Harbor, Maine USA. As the years have passed, I've counseled hundreds of agents and brokers in successful programs, such as lead generation, personal marketing, effective customer service strategies, goals achievement, and more. Now, as a "senior" broker, I find that agency owners -- or wannabee agency owners -- find some of my suggestions useful. For example, if you're an agency owner who's contemplating retirement -- or semi-retirement -- or even taking a couple of months off in winter to travel or relax in the sun -- I can step in and help you run things. Alternatively, if you're an eager Sales Agent or Associate Broker, and want to get started running your own office, I can help you with that. Need a good policy manual? Need agency trust account management? Need recruitment and training programs? Check. Check. Check. So, to celebrate the anniversary of my 30th year as a practicing Maine real estate broker, coach, and counselor, I'm venturing out on a new limb! With this exciting introduction of MaineRealEstateConsulting.com, agents, brokers, associate brokers, sellers, buyers, and people generally interested in buying and selling Maine real estate have a new place to turn for help. Do I still offer traditional, commission-based real estate services? Absolutely! Whether you're a buyer or seller, you'll get experienced, professional representation throughout your transaction. But, in conjuction with these traditional services, it doesn't matter if you have a few simple questions, or want to design and implement a marketing program that works, I'd be honored and pleased to assist you with your efforts. The fee structure is flexible. Hourly? That's fine. A percentage of your commision on closing? Flat fee? An ongoing contract? They're all fine too. Please take a few minutes and check out what we might be able to do together? Thank you for your time and your interest! I look forward to hearing from you soon! Thank you for your time and interest. Have a great day!